Disrupt alumni never cease to impress. TC50 finalist Perpetually and its web archiving technology have been acquired by Portland, Ore.- based Smarsh. Though the news hit the Web yesterday, we’re told the acquisition occurred earlier this year. Given Smarsh’s pedigree – which also specializes in archiving digital content, including IM conversations, social media interactions, and email – archiving sites as they change and update is only a natural step forward for the company. Details of the transaction were not disclosed. The Perpetually story proves how beneficial it is to be a tech startup in NYC right now. After many coffees, dinners, drinks, calls and emails in December, it became clear just how much of a support system we now have here. The people who helped make this deal work were VCs, entrepreneurs, family, salespeople, engineers, students and even an ex-Goldman banker. Most had no financial incentive to do so. Many other friends from SF helped for sure, but NYC offered a diversity of talent unavailable anywhere else. Silver is the only Perpetually employee moving over to the Smarsh team, as he was the only full-time employee at the time of acquisition. Silver originally published the aforementioned blog post yesterday titled “Perpetually Is Now Smarsh Web Archiving.” When asked why he removed the post, though he didn’t give a clear answer, Silver did provide the original copy. After an incredible roller-coaster of three short years, I’m extremely proud to announce that Perpetually has been acquired by Smarsh! The technology as we envisioned it — perfect, interactive archives of any website — is already thriving under its new name: Smarsh Web Archiving. I’ve also joined Smarsh to grow web archiving across its 15,000 customers. We’ve all been sprinting to make today’s announcement possible. Our success today is as much due to the passion of the Smarsh team as it was the Perpetually team and our investors’ risk appetite over the years — all of which paid off nicely. But there’s one group whose impact cannot be overstated: The NYC tech community. The last three years have been a wild ride, and perseverance has paid off. Next time at 1000x! Smarsh Web Archiving leverages the technology acquisition of Perpetually, LLC, the market leader in enterprise Web archiving. 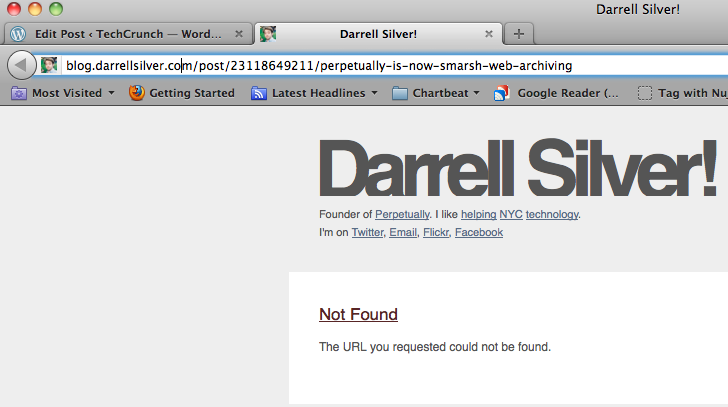 Perpetually will hereafter be referred to as Smarsh Web Archiving (clever, huh?) and according to the release it will allow users to “capture, search, preserve, produce and supervise complete websites, individual Web pages, blogs, wikis, RSS feeds, audio and video files and other content on the Web.” This includes all interactive elements like YouTube videos and Flash content, and even the links between various pages will remain intact.